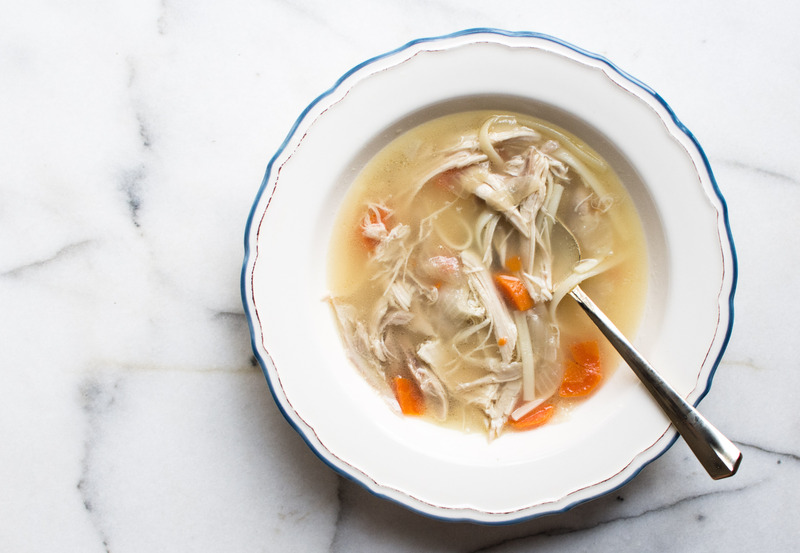 Place the chicken, onion, carrots, celery and water into a large stock pot. Bring to a boil and then reduce to a simmer, uncovered. Let simmer for 2 1/2-3 hours. Remove the chicken, onion, carrot and celery. Increase the heat and bring the stock to a boil. Add the salt and linguine to the stock. cook until tender, about 15 minutes. Decrease heat to low. Meanwhile, cut the onion, carrots and celery into bite sized pieces (or the preferred sized). Shred the chicken, and reserve 2 to 2 1/2 cups of meat. Once the noodles are cooked, add the butter, chicken and vegetables into the pan. Stir and let warm through for five minutes. This entry was tagged chicken noodle soup, chicken noodle soup recipe, chicken stock, dallas food blog, dallas food blogger, grandmas chicken noodle soup recipe, homemade chicken noodle soup, old fashioned chicken noodle soup recipe, texas food blog, texas food blogger. Bookmark the permalink.